513 pages | 35 B/W Illus. In today's competitive business environment, most companies realize that the better they can manage their customer relationships, the more successful they will become. Customer Relationship Management (CRM) software systems are key tools for companies to manage the customer-facing processes of their businesses. However, many companies have resisted implementing this most critical customer-oriented application due in large part to the lack of a single-point resource on implementing a CRM system. This book attempts to fill that gap. Implementing SAP® CRM will help technologists and managers come to grips with the vision, concept, and technology of CRM. It begins by laying out the groundwork for understanding CRM. It explains the concept and context of CRM and the tangible business benefits of CRM adoption. Demonstrating a professional approach to the evaluation and selection of SAP, it details the critical success factors (CSFs), patterns, and anti-patterns of a successful SAP CRM implementation. CRM implementations can add significant benefit to the company’s bottom line only if the company first transforms itself into a customer-centric and customer-responsive enterprise. This book explains what it means to be a customer-centric and responsive enterprise, and provides a framework for business operations based on customer relationships, rather than the traditional four Ps (product, positioning, price, promotion). It further spells out business process reengineering (BPR) strategies to configure internal business processes and operations with SAP CRM to improve customer-facing strategies, services, and relationships. 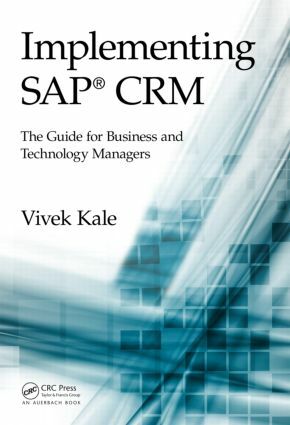 "Vivek Kale’s book is an authoritative and wide-ranging commentary on SAP CRM's value to business adopters. A much welcomed addition to my CRM library." "Vivek Kale’s book provides a significant and exceptional contribution to the body of knowledge for Customer Relationship Management (CRM). The book is unique in that it explains the role that software technology has in implementing and sustaining a robust CRM business program. It is written with a comfortable style and does an excellent job of explaining the nuances of CRM." Why Are SAP Implementation Programs So Complex? Prospects for the Future: Relationships on Demand! Vivek Kale has more than two decades of professional IT experience, during which he has handled and consulted on various aspects of enterprise-wide information modeling, enterprise architectures, business process redesign, and e-business architectures. He has been group CIO of Essar Group, the steel, oil, and gas major of India, as well as Raymond Ltd., the textile and apparel major of India. He is a seasoned practitioner in transforming the business of IT, facilitating business agility, and enabling the process-oriented enterprise. He is the author of Implementing SAP R/3: The Guide for Business and Technology Managers (2000), A Guide to Implementing the Oracle Siebel CRM 8.x (2009), Guide to Cloud Computing for Business and Technology Managers: From Distributed Computing to Cloudware Applications (2014), and Inverting the Paradox of Excellence: How Companies Use Variations for Business Excellence and How Enterprise Variations Are Enabled by SAP (2014).